For only three years the members of the Group of fine artists worked in the cubist style before WW1 started. Although a few iconic buildings that attract both Prague inhabitants and the tourists were built in this ultra-modern style. House of the Black Madonna is one of them. Today there is a gallery of this avant-garde style. At the beginning of the 20th century, Paris was the center of the artistic world, it attracted painters, poets, writers, and journalists, and young Czech men often went there for study visits. Geometrical pictures in subdued colors from Pablo Picasso, George Braque, Juan Gris or Paul Cézanne seemed to them as a revelation. Emil Filla, in particular, tried to present this avant-garde work in the Mánes Society, the most important artistic institution back then, and to involve it in the Czech context. Several other artists of his generation joined him, but the reluctant opinion of Manes Society (that was working in the Art Nouveau style) did not change. They decided to leave the Society, and in 1911 they founded the Group of fine artists, which soon the sculptor Otto Gutfreund, the painter and writer Josef Čapek, the painters Vincenc Beneš and Antonín Procházka, the architects Josef Gočár, Pavel Janák, Vlastislav Hofman and Josef Chochol joined. In October of that year, they released the first issue of the Artistic Monthly Journal, which formulated the principles of new art and became a European-style platform of a strong opinion. The public noticed the new style at the exhibition in 1912 in the Municipal House, which presented paintings, sculptures, applied arts, and architecture. Small objects and cubist buildings pleasantly surprised the visitors, the artwork more or less evoked embarrassment. The Group of fine artists was quite homogeneous and its members worked within the same thinking framework. Through their work, they sought to uncover and name the general principles of artwork. They were exploring the world and its view from all angles of view, and the angular shapes symbolized these different angles. Order and absolute (unchangeable, universally valid) formation of the mass in space have become the ideal and the starting point of their work. New art was appealing mainly to the young generation of artists (everyone was between 25 and 30 years old) and in the general society, it was pretty much standing on the edge of interest. During the short duration of about four years, he was unable to make it to the main artistic stream. “What’s more surprising is the significant trace cubism has left in Czech art, although we appreciate it only with a time delay,” says Radka Potměšilová, who guides us through the collections. All the Cubist buildings were designed by men in their thirties at the beginning of their careers, yet they still managed to capture both shape and applied function. 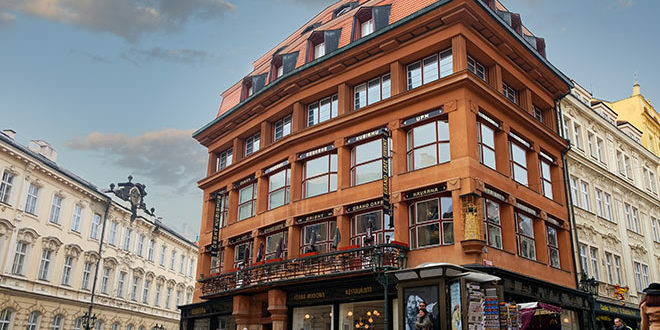 The House of the Black Madonna was designed by architect Josef Gočár in 1911 for the merchant František Herbst as a department store. The pupil of Jan Kotěra started with the first designs in his studio in 1905, he became independent in 1908, and he passed the graduation from architecture with the Red Villa for Josef Binka in Krucemburk. He was inspired by the English country style and the decorative folk art of Dušan Jurkovič. A water basin at Bohdaneč Spa and Winternitz’s automatic mills in Pardubice has followed. He also returned to Bohdaneč Spa in his Cubist period and built a spa house there, which bears his name until current days. František Herbst, the wholesaler, addressed the 31-year-old Gočár intentionally. He boldly uncovered whole front face, which brought a natural daylight into the interior, and made it possible to see the displayed goods to the people passing by. 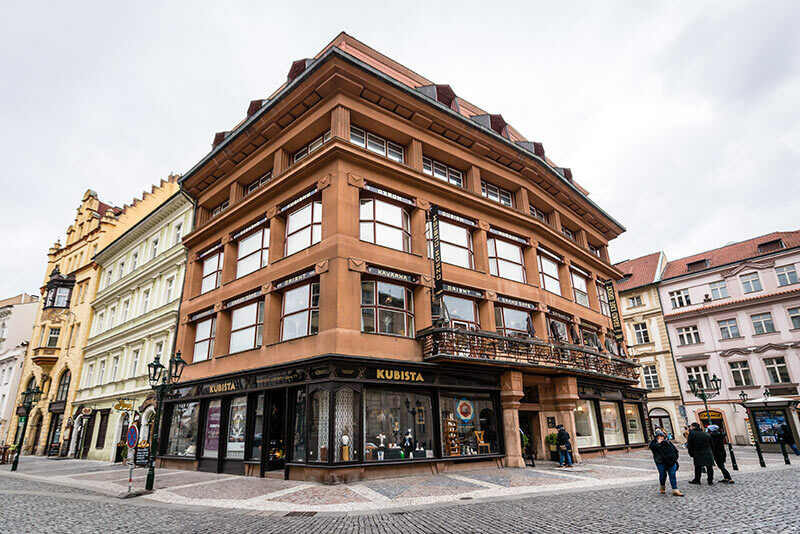 For a future new department store, František Herbst purchased a new baroque house between Celetná and Ovocný trh and left Josef Gočár a free hand. He trusted him so much that he agreed to design the building in a completely new style. In August 1911, the Prague City Council discussed the project and recommended to rework it because it did not fit into existing buildings architecturally. Josef Gočár highlighted the Cubist elements in the project, added a lancet front face, a cubic balcony rail, the head of the pillars between the columns and mainly the American-type windows, instead of the original flat-panel ones. 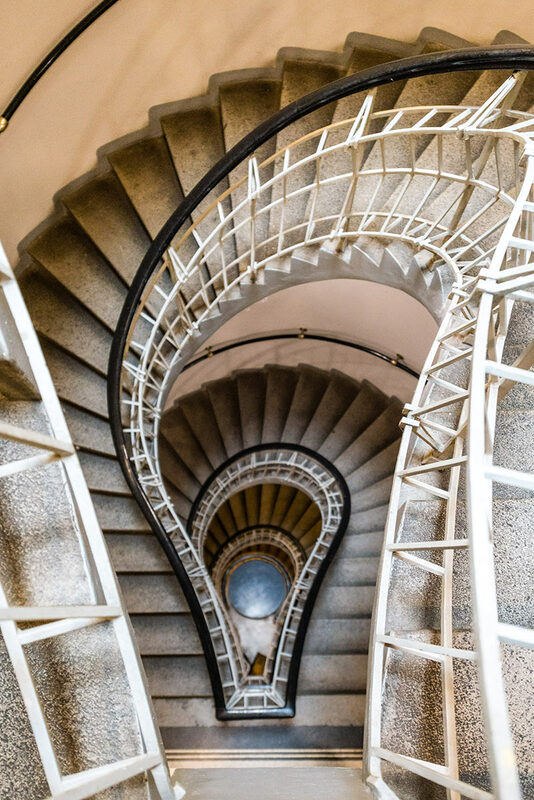 The design was approved at the beginning of 1912, and in nine months the building welcomed the first guests. Not only its appearance was revolutionary, but also its reinforced concrete construction, which allowed to open the space without column partitions and to use large windows at the same time. Josef Gočár designed not only the building itself but also its interiors including chandeliers and furniture. A distinctive Cubist entrance door opened to a corridor leading to the staircase at the back of the house, which connected the four floors. In the basement there used to be a wine cellar, the Cafe Grand Café Orient operated on the first floor, but after only ten years it was closed for being old-fashioned. The renovation took place only during the complete reconstruction of the building in 2005. In the meantime, however, the house was undergoing various modifications, the first one in 1914 already. The area of the café served as Rudolf Moses’ bank offices, boutiques on the second-floor turned into Eduard Bellak’s banking offices. On the third floor, there were offices and the fourth floor was designed for apartments. After the war, all the apartments were divided into small offices of the National company “Exhibition”. The devastated house was reconstructed at the beginning of the 90s by architect Karel Prager, who tried to bring it back to its original condition and at the same time he had finished the glass roof already designed by Josef Gočár, but for unknown reasons, it was not built. On the fourth floor, a terrace with a wonderful view of the surrounding roofs was created thanks to the roof. On the ground floor, there is nowadays a cash desk and a shop with replicas of cubist ceramics and glasswork. Next to it, on a place of a former Jackpot shop, a restaurant Black Madonna opened recently. 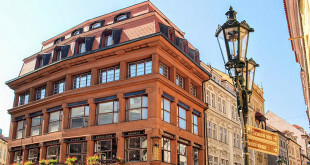 On two floors there it introduces typical cubist interior and popular international and Czech dishes are served there. The House was managed by the State Fund of Culture, to which it was given when upon its founding in 1992. Cultural projects were intended to be financed with Lotynka lottery, and it lent 350 million crowns to start it. The owners put the House of the Black Madonna and the Hybern Palace in the pledge to the bank. When the business plan collapsed, the fund was redeemed with a donation from the state budget, which was to be repaid from the rental of monuments. Last year, the Ministry of Finance had forgiven the remaining debt of the fund. Almost five years after the Velvet Revolution, the building was reopened to the public – as a center of Czech fine art. The Czech Museum of Fine Arts presented fine art with an emphasis on Cubism from Czech and from foreign countries in both permanent and short-term exhibitions. In 2003 the National Gallery presented a complex collection of cubism from its collections. Five years ago the building was taken over by the Museum of Decorative Arts, and cubist furniture, used objects, wallpapers, posters inviting to the period exhibitions, and artworks to present this world phenomenon in the context of time and artistic trends were installed on the second and third floor. While Cubism was manifested mainly in painting or sculpture and only marginally in architecture in the rest of the world, in Czech environment it became a complex style. Architects such as Gočár, Janák, Hofman or Chochol have designed buildings and furniture, first for themselves and later for their friends. Josef Gočár and Pavel Janák founded the Prague Art Workshops in 1912 where they created their design. In their program statement, they stated that “furniture should not only serve and be made according to somehow good style, it should be a serious artwork of substantial content.” The furniture gave them an ideal opportunity to experiment with form and design details. “Sharp angles, analogical to sloping surfaces and diagonal cuts of shapes in Cubist paintings and sculptures, and the slanting of load-bearing parts have demanded completely new construction procedures. The characteristic feature, alongside the dynamic shape, was smooth, monochromatic surfaces, free of any plastic décor that would disturb the elementary form. Structural and spatial relations were often emphasized by the composition of the veneer, in upholstered furniture, the provocative effect was often achieved by very bright and striking color of the textile, “says Lucie Vlčková, curator of the collection. Small items such as vases, tea and coffee services, ashtrays or glasswork have gotten into small-scale production, so you also might have a cubist jewel at home.